The Renault FT (frequently referred to in post-World War I literature as the FT-17, FT17, or similar) was a French light tank that was among the most revolutionary and influential tank designs in history. The FT was the first production tank to have its armament within a fully rotating turret. The Renault FT's configuration – crew compartment at the front, engine compartment at the back, and main armament in a revolving turret – became and remains the standard tank layout. 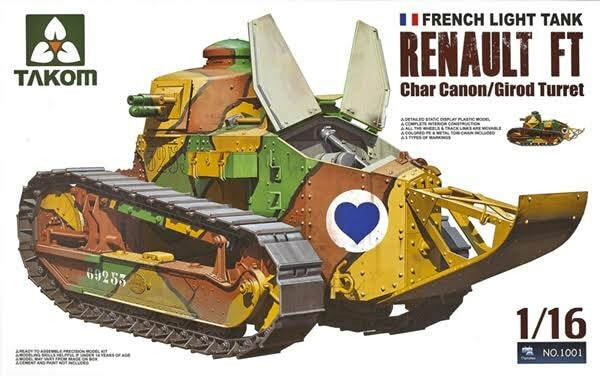 As such, some historians of armoured warfare have called the Renault FT the world's first modern tank. It is thought possible that Louis Renault began working on the idea as early as 21 December 1915, after a visit from Colonel J. B. E. Estienne. Estienne had drawn up plans for a tracked armoured vehicle based on the Holt caterpillar tractor, and, with permission from General Joffre, approached Renault as a possible manufacturer. Renault declined, saying that his company was operating at full capacity producing war materiel and that he had no experience of tracked vehicles. Estienne took his plans to the Schneider company, where they became France's first operational tank, the Schneider CA. 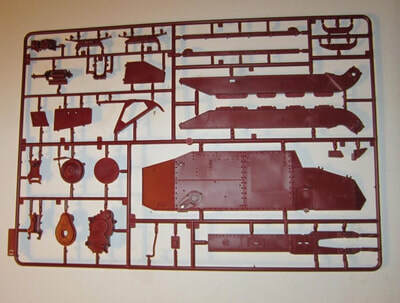 Louis Renault himself conceived the new tank's overall design and set its basic specifications. He imposed a realistic limit to the FT's projected weight, which could not exceed 7 tons. Louis Renault was unconvinced that a sufficient power-to-weight ratio could be achieved with the production engines available at the time to give sufficient mobility to the heavy tank types requested by the military. Renault's most talented industrial designer, Rodolphe Ernst-Metzmaier, generated the FT's detailed execution plans. Charles-Edmond Serre, a long time associate of Louis Renault, organized and supervised the new tank's mass production. The FT's tracks were kept automatically under tension to prevent derailments, while a rounded tail piece facilitated the crossing of trenches. Because the engine had been designed to function normally under any slant, very steep slopes could be negotiated by the Renault FT without loss of power. Effective internal ventilation was provided by the engine's radiator fan, which drew its air through the front crew compartment of the tank and forced it out through the rear engine's compartment. Renault's design was technically far more advanced than the other two French tanks at the time, namely the Schneider CA1 (1916) and the heavy Saint-Chamond (1917). Nevertheless, Renault encountered some early difficulties in getting his proposal fully supported by Estienne. After the first British use of heavy tanks on 15 September 1916 during the Battle of the Somme, the French military still pondered whether a large number of light tanks would be preferable to a smaller number of superheavy tanks (the later Char 2C). On 27 November 1916, Estienne had sent to the French Commander in Chief a personal memorandum proposing the immediate adoption and mass manufacture of a light tank based on the specifications of the Renault prototype. After receiving two large government orders for the FT tank, one in April 1917 and the other in June 1917, Renault was at last able to proceed. His design remained in competition with the superheavy Char 2C until the end of the war. About half of all FTs were manufactured in Renault's factory at Boulogne-Billancourt near Paris, with the remainder subcontracted to other companies. Of the original order for 3,530, Renault accounted for 1,850 (52 per cent), Berliet 800 (23 per cent), SOMUA (a subsidiary of Schneider & Cie) 600 (17 per cent), and Delaunay-Belleville 280 (8 per cent). When the order was increased to 7,820 in 1918, production was distributed in roughly the same proportion. Louis Renault agreed to waive royalties for all Frecnh manufacturers of the FT. Transmission: sliding gear; four speeds forward, one reverse. One main clutch plus two subsidiary clutches (one for each of the two tracks) used for steering the tank. Wars: WWI, Russian Civil War, Polish-Soviet War, Chinese Civil War, Spanish Civil War, WWII, Fraco-Thai War, Turkish War of Indepence, 1948 Arab-Israeli War, Winter War (by Finland). 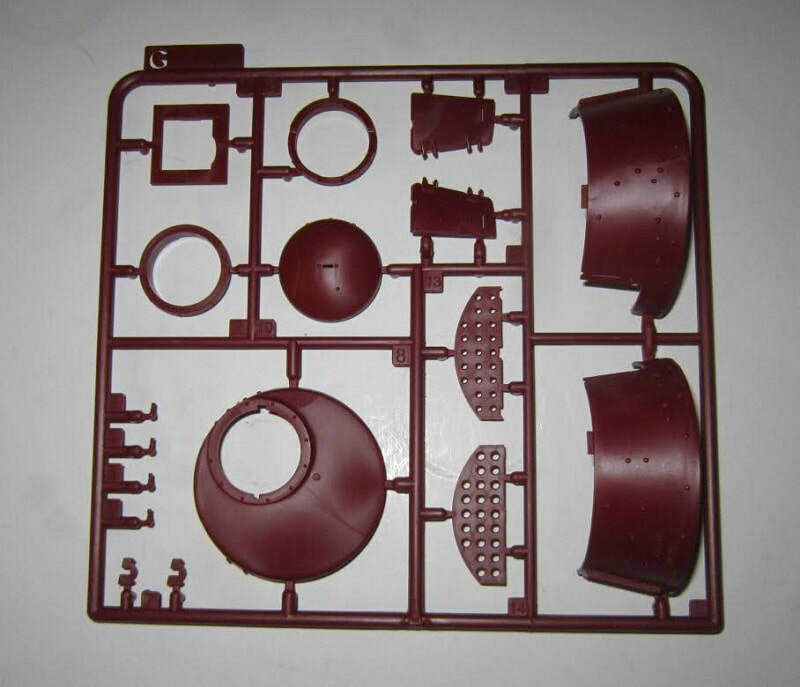 Takom is a fairly new model company based in Hong Kong, China. The box art shows the FT posed against an all-white background, similar to how Tamiya does the majority of their box arts also. It has patches of dark-green, hull-red and dark-earth yellow, with each patch outlined in black. It's engine doors are shown open. It has a white circle with a red heart on it at the rear end of the sides. It is with the 2nd Section, 1st Company, 505E RAS, 1918 France. The white serial no. 69235 is on the sides of the suspension girders. 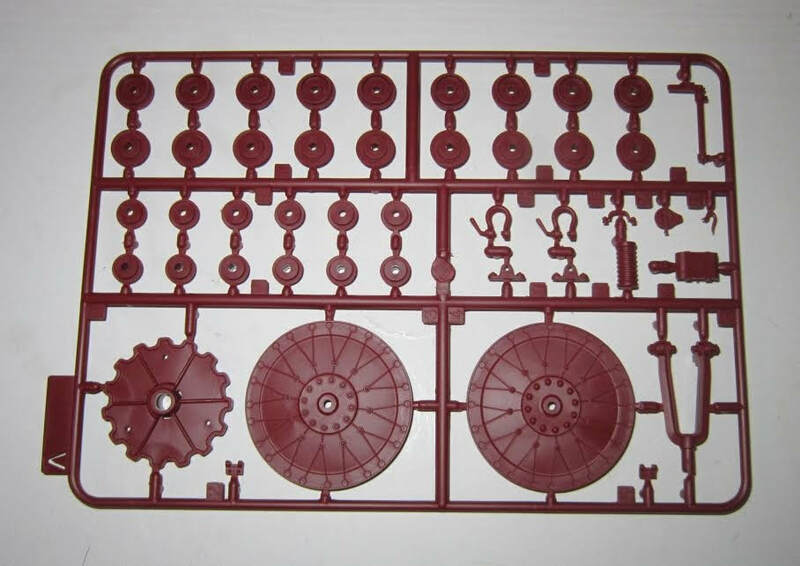 Features listed on the box art are: detailed static display plastic model, complete interior construction, all wheels and track links are movable, colored PE and metal tow chain included, 3 types of markings. Followed by a small color profile of the box art scheme. 2. A FT that is in a base of sand-yellow with olive-green spots. It has a white diamond with a red heart on it on its turret sides and rear. It is with the 2nd Section, 1st Company 505E RAS, France 1918. 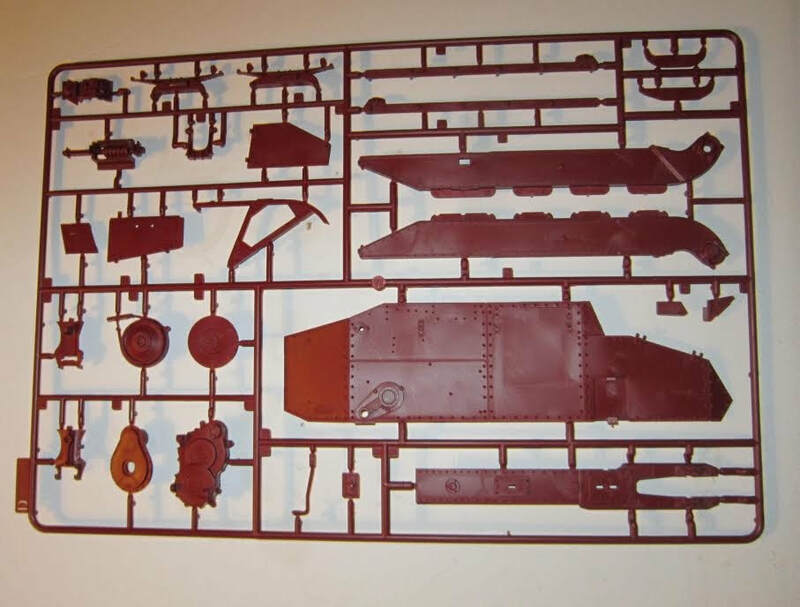 The other side panel has illustrations of the 13 parts trees, PE fret, decal sheet, metal chain and the instruction book in the kit. 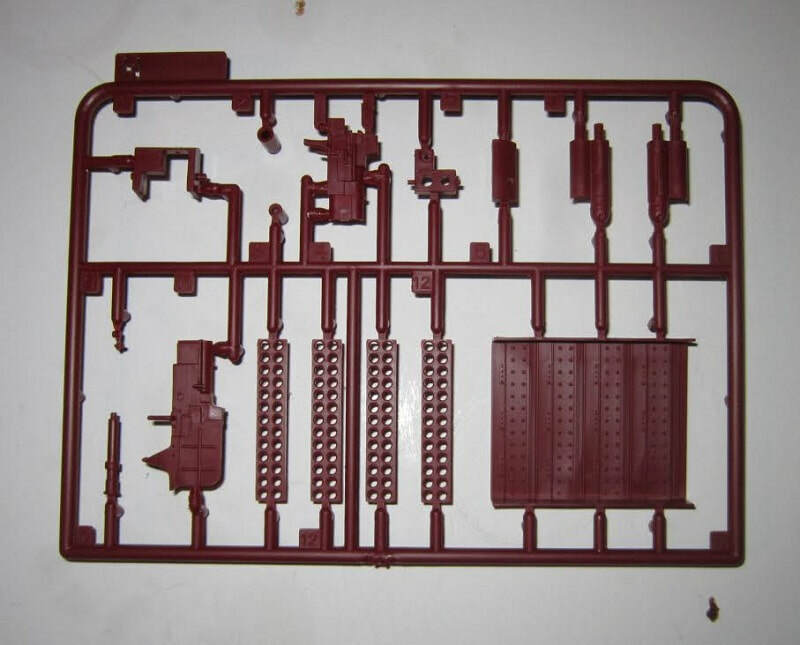 Takom's street address and web site address are shown, with a copyright date of 2013 and MADE IN CHINA. 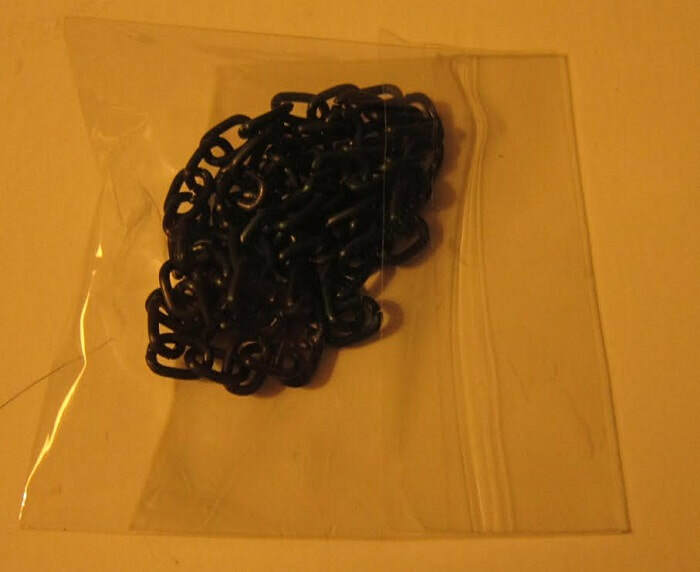 The kit contains 13 dark-green parts trees in 9 sealed clear cello bags, the brass PE fret, decal sheet and metal chain in cello bags inside another cello bag with the instruction booklet. The instructions consist of a staple-bound booklet of 14 pages in 11 1/2" x 8" page format, with a slick-coated bright blue cover. The front cover has the history of the FT in white lettering and a black line-drawing of the FT. 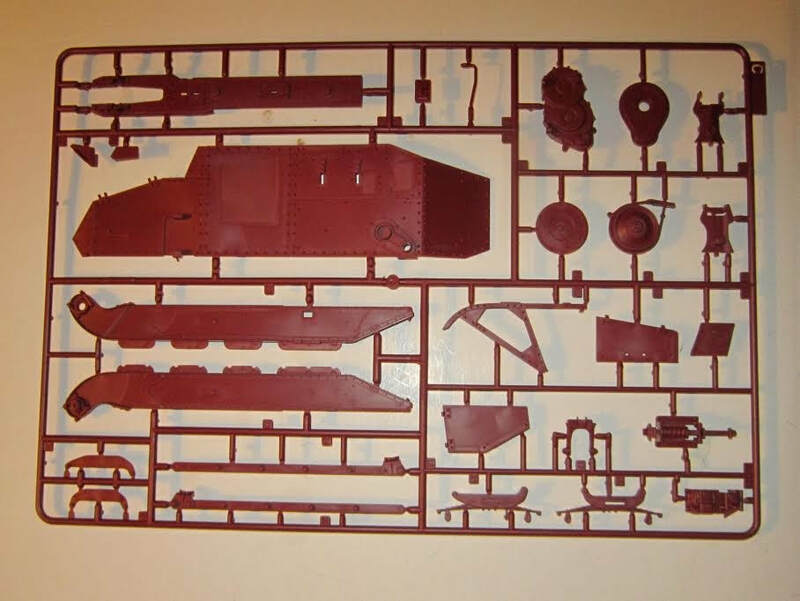 Page 1 of the booklet begins with READ BEFORE ASSEMBLY instructions, over international assembly symbol explanations, a suggested paint colors listing, decal application instructions and removing PE from the frets instructions. Page 3 through the left side of page 14 have 38 assembly steps. 3. A FT in a wave pattern of olive-green, dark sand-yellow and hull red. It has a white wording "Passe Par Tout" on the sides of the turret and just the word "Tout" on the rear of the turret. It is with Company C, 327th Tank Battalion, 1st U.S. Tank Brigade, St. Mihile, September 1918. 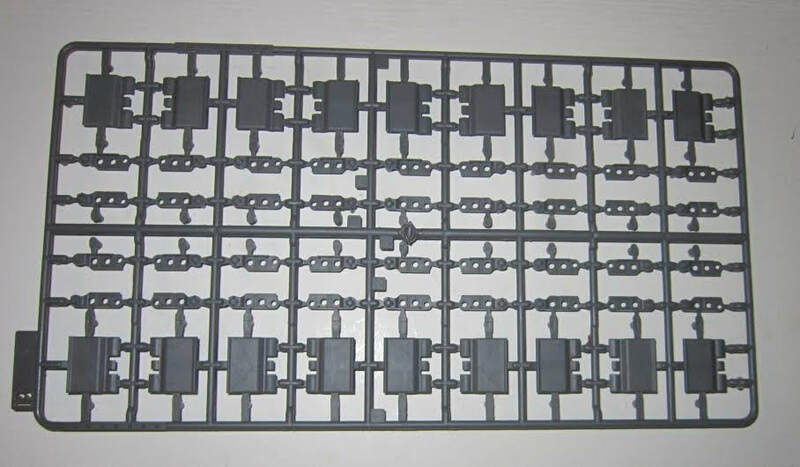 ​The steel chain, decal sheet and brass PE fret complete the kits contents. 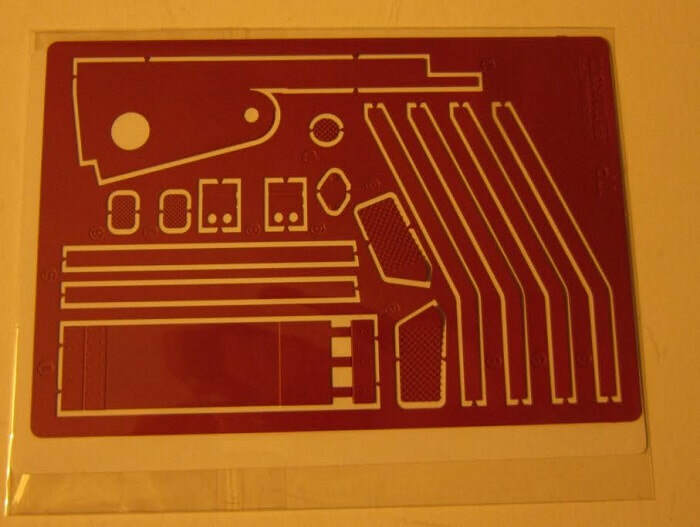 The PE fret is called out as PE in the parts illustrations, but in the assembly steps parts from it are called out as TP. 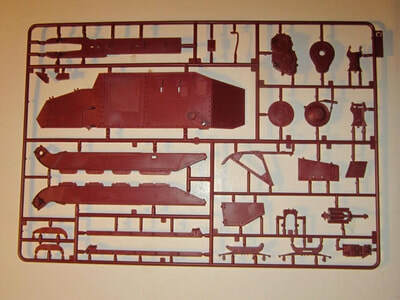 ​ The photo etch parts include the driver's seat pedals and other parts. 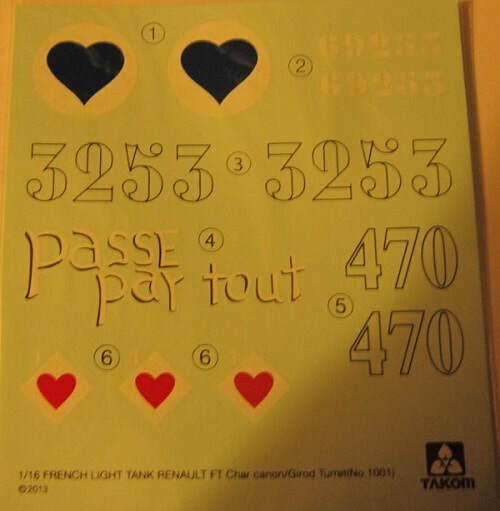 The decal sheet for the versions already mentioned. 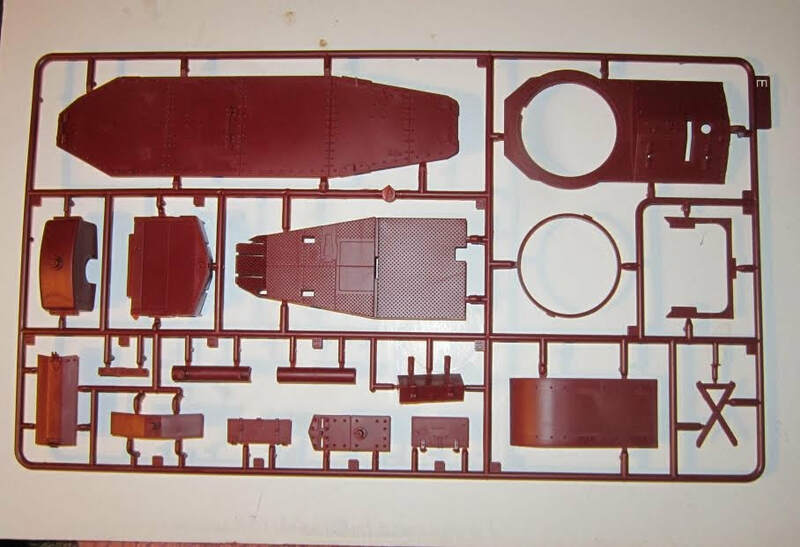 There are no clear parts or crew figures included in the kit. It is very detailed both inside and out. Highly recommend to modelers with experience. Not for the beginning modeler and not a week end project. Great large scale.